Small wonders: ants follow a scent-line up a eucalypt trunk. I love a good mondegreen. By simple definition a mondegreen is a miss-heard song lyric, and one of my favourites forms the title of this post. It refers to Bob Dylan’s “Blowin’ in the Wind”, in the chorus of which he sings “the answer my friends is blowin’ in the wind”. It’s fair to say Bob was never the clearest articulator of lyrics, so this mondegreen, which makes the chorus sound like a friendship pact with the Formicidae family, was probably inevitable. Most of us would probably have difficulty singing that pro-ant chorus with any degree of feeling. Put simply we’re not on very amiable terms with ants. Their ability to spoil our picnics and trample indiscriminately through our kitchens, is exacerbated by the capacity of some to bite and sting. But what if we did learn to appreciate these little wonders? Moving to a house among the gum trees has made me think it might be possible. That house is built on the rear section of our old house block, in what used to be a eucalypt forest. When our children were young we often played up there among the trees, taking for granted that we would come across lots of small foraging ants. We would occasionally pause to watch long lines of them climbing up and down the tree trunks. Awed by their gravity-defying abilities, we also wondered what they were after or where they were nesting. But soon we’d get back to our own business, and leave them to theirs. Years later, when the new house was built, several of those forest trees were toppled to make way for it. Remove a tree and you remove what has been larder, road system, refuge, nest and meeting place for some ant species. Replace the trees with a building and, from an ant point-of-view, you lay out the welcome mat. Effectively you’ve put back some of their former resources. 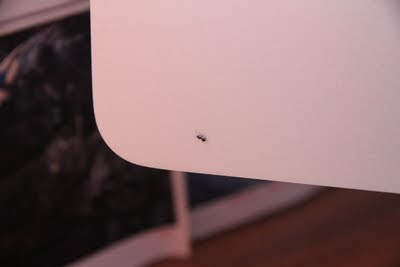 So after all these years of admiring our small black ants from a distance, I now find I’m getting to know them up close. In fact a few of them are ambling up my computer monitor as I type. My guess is that they’re a small species belonging to the genus Iridomyrmex, which normally like to forage in eucalypt trees. Since our house has become a substitute tree, they are happy negotiating their way in, over, around and throughout our house. If ants ponder, they may think it a strangely misshapen, rigid and hard-shelled sort of tree. On the other hand its hollows are vast, its hiding places legion, its “roads” neat and smooth, and its food supplies copious and replenished daily. Today we head out into the local bush with our young granddaughters. 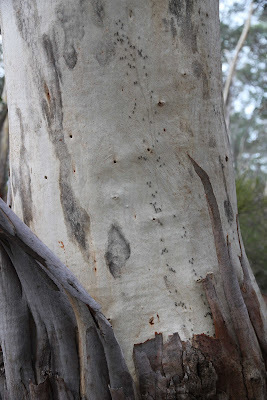 I’ve given them the task of finding ant trails on eucalypt trunks. They search hard but find very few. We decide it must be ant sabbath. A long spell of fine, warm weather is ending, and perhaps the bulk of their labour is, for the moment, done. I think of the Bible proverb that advises the lazy: “Go to the ant, thou sluggard; consider her ways, and be wise: which, having no guide, overseer, or ruler, provideth her meat in the summer, and gathereth her food in the harvest.” (Proverbs 6:6-8, KJV) Perhaps today all has been safely gathered in, and our ants are indoors having whatever sabbath rest they’re allowed. I had been keen to test out a theory on today’s walk. Having noticed that ants often climb on the northern or western sides of a tree (or a house), but seldom on the southern and eastern side, I wanted to test it with further observation. My conjecture is that they might favour the warmer, drier sides of these structures as these provide easier access and better shelter. Today’s walk provides too small a sample to really test my theory, but we do get to see a few ant trails. In effect these are invisible pathways that follow a pheromone scent laid down by the lead foragers: more scent-line than song-line. A long and heavily-used trail may be the sign of successful foraging. But today we also observe numerous ants leaving from, and delivering to, a nest hollow. We also notice how amazingly prolific these little invertebrates are. Everywhere our bush ramble takes us we find evidence of ants. There are ant in hills, ants on the ground, ants under bark, ants cleaning up the dead, even ants under attack (in the form of echidna diggings). Somebody has to do it! 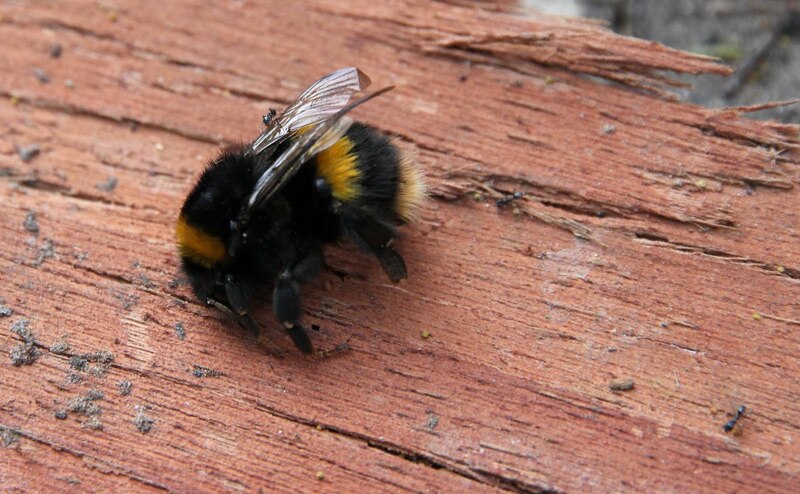 Ants clean up a dead bumble bee. By dint of hard work and numbers, ants must be considered among the real movers and shakers of the animal kingdom. Their work in turning over soil, fertilising plants, and removing a huge volume of dead plant and animal matter means they literally help re-shape the face of the earth. I learn that our Iridomyrmex ants even have a symbiotic relationship with certain caterpillars. In return for providing a security service to the caterpillars, they receive food in the form of a sweet secretion from the grubs. It’s not much of a stretch to suggest that we’re actually in a similar relationship with ants. We just might not realise what good friends they can be to us.